This tomato with the vine attached caught my eye in the kitchen this morning, so I took it up to the studio to paint. 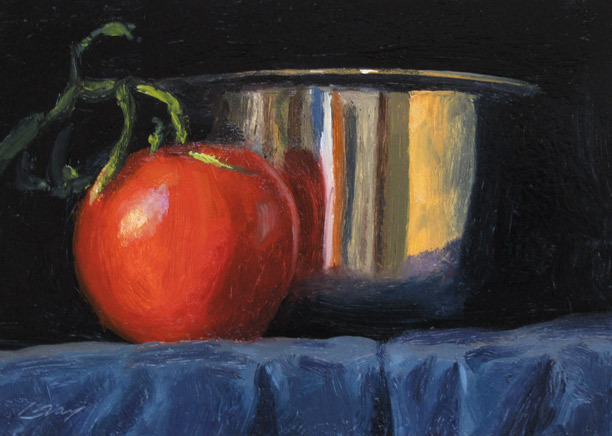 I loved how it looked against the stainless bowl, and the blue cloth added to the color richness. That Kitchen-Peace speaks for itself; love it! There's definitely something about the tomato in front of the stainless steel bowl and the dark background and blue cloth that makes it really POP! Love it. Nice one Don! We have the same kind of tomatoes and you painted it exactly as it looks. My husband saw the tomatoes on our kitchen counter and said "why don't you paint those, they are beautiful". I guess you got to it first! Rudhi--thanks! I see you posted tomatoes yesterday too! Thanks, Debbi! It's basically a primary color scheme, counting the yellow reflection in the bowl. I think that helps it pop. Thanks a lot, Cathleen! I'd like to see you paint the tomatoes...you'd bring your own vibrant style to them.